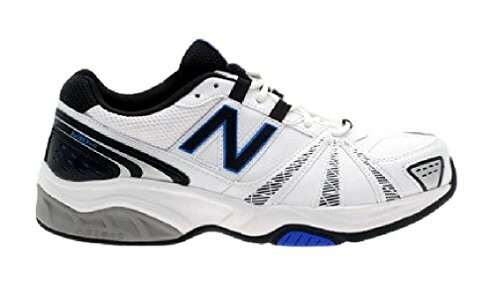 New Balance MX630v2 Training Shoes (4E Width) – 13.5. The MX630v2 Training Shoes are designed with a comfortable synthetic and mesh upper with strategic positioned overlays to help keep your foot firmly in place whilst you perform whilst also without adding undue weight. The New Balance MX360v2 is constructed with shock absorbing injection-moulded EVA foam which provides for firm but flexible cushioning that is embedded into the midsole to help support the arch and help create a smoother gate. New Balance’s ABZORB® technology has been constructed into this running shoe and works in conjunction with the EVA rubber outsole, this has the lightweight and comfort characteristics of EVA foam, but it stays bouncy much longer than EVA and other foams. In engineering terms, it resists compression set, which means it lasts longer. The MX630v2 PL-1 offers an anatomical heel width with a lower instep, reduced volume in the toe box depth and reduced lateral forefoot girth in the width for a fit that follows the shape of the foot. Synthetic And Mesh Upper – Provides for comfortable feel whilst performing. Strategic Positioned Overlays – Helps to lock your foot into place whilst you perform whilst also without adding undue weight. EVA Foam – Provides for firm but flexible cushioning that is embedded into the midsole. ABZORB® technology – Works in conjunction with the EVA rubber outsole that resists compression for greater performance. PL-1 Anatomical Heel – Reduced volume in the toe box depth and reduced lateral forefoot girth in the width for a fit that follows the shape of the foot.